Blaina and Nantyglo Fire Brigade – Formation and Early History. In the mid to late 1880’s the need for protection against fire in the district was first brought to the attention of the Nantyglo and Blaina Local Board by Mr Edmund Harris. The matter was held over until a later date. On Thursday 25th October 1888 a monthly meeting of the Nantyglo and Blaina Local Board was held at the local board offices. Those present were as follows – Mr Thos Morgan M.E. (Chairman); Mr John Dakers; Mr J. P. D. Williams; Mr H. W. Buddicom; Mr Daniel Lewis; Mr John Evans; Mr Rosser Rosser; Mr W. Parry (Contractor); Mr James Allen; Mr G. R. Harris; Mr John A. Shepard (Clerk) and Mr G. Stevens (Surveyor): At this meeting the need for protection against any possible out-breaks of fire in the district was again mentioned. The Pontypool Free Press reported – Mr G. R. Harris referred at some length to the lack of protection in case of fire. He said “There was plenty of water but no means of using it”, Mr Harris suggested providing a hose and reel. The chairman stated the matter had been mentioned previously by Mr Edmund Harris but had been shelved. He instructed the surveyor to see what could be done before the next meeting. The following month the surveyor reported back to the local board with reference to the hose and reel though no more was said about it until March 1889. In March 1889, tenders were received for hose, reel and fire appliances in case of a fire in the district. That of Messrs Merryweather & Sons of London at a cost of £78 was accepted. The appliances were received in May 1889. The local board stated the building they were to be kept was not suitable for such and had to be stored at the board offices. 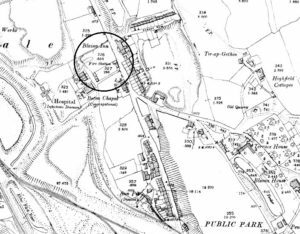 A short while later a fire station was established (as seen circled on the map left) opposite the Blaina Inn at Blaina. The Formation of the Nantyglo and Blaina Fire Brigade. On Thursday 19th December 1889 a meeting of the Nantyglo and Blaina Local Board was held at the board offices. Those present were as follows – Mr Thomas Morgan (Chairman); Mr E. Harris; Mr J. Bainton; Mr J. Allen; Mr Rosser Rosser; Mr W. Parry (Grocer); Mr G. R. Harris; Mr John Evans; Mr J. P. D. Williams; Mr J. A. Shepard (Solicitor Clerk); Mr H. C. Bevan (Medical Officer) and Mr W. G. Stevens (Surveyor): At this meeting the recommendation to form a volunteer fire brigade was adopted on the motion of Mr Bainton and a committee was appointed to select suitable men from the applicants for membership into the brigade. The committee consisted of – Mr J. Bainton, Mr J. Evans and councillors Mr W. Parry and Mr G. R. Harris. On Thursday 2nd January 1890, the Nantyglo and Blaina Local Board Committee recommended that the volunteer fire brigade should consist of a captain, a foreman and ten firemen. The surveyor issued notices inviting active and steady men to join the “Volunteer Fire Brigade” the remuneration for the foreman be at a rate of 6d. for each practice and 1s. per hour in case of a fire. The officers and firemen be provided with a helmet, cap, tunic, life-line, lamp and an axe and that a delivery pipe and whistle to be procured, the uniform etc be kept at the fire brigade station. The Founding Members of the Nantyglo and Blaina Fire Brigade. The remuneration for the foreman was at a rate of 6d. for each practice and 1s. per hour to attend a fire. The cost of the uniforms were placed at between £40 and £50 the costs were objected to and voted to be met through public conscription’s, the debate was the need for uniforms to be given to the members of the brigade to make the men stand out from members of the public when fighting fires. The debate was held over until the next meeting. The council finally agreed to pay for the cost of the uniforms. Mr G. R. Harris complained that the brigade consisted mostly of local board members even though they had received 22 applications for firemen, though Mr Bainton replied that they went through all applications and thought they had made the correct arrangement. The local board also proposed to ask the collieries of Messrs J. Lancaster & Co for the use of their steam hooters as an alarm in case of fires in the district. In March 1890, the tenders for the supplying of the Volunteer Fire Brigade requisites were opened and it was decided to accept that of Messrs Shand, Mason & Co, London amounting to £42. 10s. 0d. Messrs Morris & Son won the contract to supply their uniforms. On Tuesday evening, 22nd April 1890, the Volunteer Fire Brigade’s first drill came to test their efficiency when the mock alarm came from the Board School at Blaina. Within ten minutes the men were dressed in their uniforms and on the ground, minutes later they were at the school watched by many on-lookers, the brigade afterwards marched through the town to the Blaina Inn where they were entertained to dinner by the Nantyglo and Blaina Local Board. On Saturday 13th September 1890, the Volunteer Fire Brigade had its first official group photograph taken. On Thursday 15th January 1891 the Volunteer Fire Brigade attended to a fire alarm at the John Lancaster Offices, Blaina. The fire was lit for the purpose of testing the promptness of the brigade. The brigade were soon on the spot with their hose, reel and fire escape and the blaze was soon put out. It was reported that the whole exercise only took 30 minutes from the time the alarm was raised to the time it was extinguished. It was also reported that hundreds of people were present to view the spectacle. The Blowing of the Blaina Pit Hooters. On Tuesday 17th February 1891, at 9.00pm in the evening, there was panic in the town of Abertillery and also Cwmtillery when the drone of the pit-hooters were heard echoing through the valley. Fearing a disaster had occurred in one of the collieries, Rose Heyworth, Cwmtillery, or the Penybont Tillery, hundreds of people took to the streets in panic. News spread that a disaster had occurred at Cwmtillery Colliery, it was reported that many aged women with husbands and sons working in the mines fell ill with worry and anxiety and was incapacitated with fright. People made their way up the valley to the pit, fortunately, only to find nothing was wrong, it had been a false alarm and to their amazement told that no pit in this area had sounded their hooters! It was later made clear that what the people had heard that night was the Blaina collieries hooters being blown to summon the Blaina Volunteer Fire Brigade to a fire-drill and that particular night the wind had eased and the valley was silent, the Blaina hooters could be heard all the way down through the valley to Abertillery. On Wednesday 18th February 1891 the Volunteer Fire Brigade were entertained by Mr John Dakers and other members of the local board to a supper at the Queens Hotel, Blaina. On Thursday 25th June 1891 a meeting of the Nantyglo and Blaina Local Board was held at the boards offices. Those present were as follows – Mr J. P. D. Williams (Chairman); Mr Edwin Griffiths; Mr Rosser Rosser; Mr William Rees; Mr G. R. Harris; Dr H. C. Bevan (Medical Officer); Mr J. A. Shepard (Clerk) and Mr G. Stevens (Surveyor): At this meeting there was a report on the fire that had broken out at the Blaina Tin Works and was extinguished by the Volunteer Fire Brigade. The brigade’s expenses were £3. 8s. od. though an half of an hour was lost by the fire brigade at the commencement of the fire owing to a defective hooter. Mr G. R. Harris stated that the cost should not have to be put on the local board and should be paid by the Tin Works Company. The Surveyor Mr G. Stevens said he had received a cheque for the £3. 10s. 0d. from the Tin Works Company but had distributed it amongst the members of the fire brigade. Mr Buddicom explained it was a free gift to the men. Mr G. R. Harris wanted to know if the men had a claim on the money as they were getting paid for their services by the local board. Mr Griffiths later said that the money amounted to 5s. per man and was scandalous considering men could have been found to extinguish the fire as a neighbourly act. At the same meeting a committee was set up to deal with the fire brigade regulations and to deal with the alarm questions. The names of the committee men were as follows – Mr John Dakers (Chairman); Mr G. R. Harris; Mr W. Parry (Contractor); Mr W. Rees; Mr E. Griffiths; Mr R. Rosser and Mr G. Bennett. At this time, the local board were purchasing two “Sirenetle” alarms at the cost of £20. On Thursday 23rd July 1891, at a meeting of the Nantyglo and Blaina Local Board the question of the payment of £3. 10s. 0d. to the members of the fire brigade was again raised. Mr Buddicom stated he had given the money as a gift and it had nothing to do with the local board, Mr Allen moved the money go to the men of the fire brigade, Mr Bennett seconded and it was carried. The Chairman Mr John Dakers said there had been no rules in connection with the fire brigade and asked the surveyor to approach the Ebbw Vale Brigade to ask for a copy of their rules and regulations and to copy a draft for the next meeting. In August 1894 at a monthly meeting of the local board it was stated the the Volunteer Fire Brigade at Nantyglo and Blaina had cost £140 to set up and at this point no fires had been reported in the area. On Wednesday 1st August 1894, Mr George Stevens, Captain of the Blaina Volunteer Fire Brigade and Blaina Local Board Surveyor left Blaina to become the surveyor for the Abercarn District Local Board. He resigned his post as captain of the fire brigade though he later helped the Abercarn District Local Board in the formation of their own fire brigade and eventually became their brigades captain with Mr Howe as lieutenant. In July 1899 the Nantyglo and Blaina Local Board issued rules and regulations on the policeman’s roll in the event of a fire, they stated that while in attendance at a fire situation, the police were under the direct command of the captain of the fire brigade. The Volunteer Fire Brigade at Blaina was known as such in early reports though became known as the Nantyglo & Blaina Fire Brigade. It’s hard to pinpoint its name change though it did seem to be a gradual change from one to the other over a period of time. The Fire Brigade Members Grievances. On Thursday 23rd November 1899 a monthly meeting of the Nantyglo and Blaina Local Board was held at the board offices. Those present were as follows – Mr G. R. Harris (Chairman); Rev D. Lewis; Mr Price (Vice Chairman); Mr W. Gregson; Mr Edwin Griffiths; Mr Llewellyn Blunt; Mr D. Rees; Mr William Williams; Mr J. A. Shepard (Clerk); Mr Gough (Assistant Clerk); Dr H. C. Bevan (Medical Officer); Mr Lloyd Roach (Surveyor); Mr L. Richards (Collector) and Mr T. Davies: At this meeting the council reported the money paid to the Blaina firemen in wages during the past month amounted to £4. 11s. 3d. It was also reported that the captain of the fire brigade was receiving a salary of £5. per annum. Also at this same meeting Chairman Mr Gregson, of the Fire Brigade Committee presented a report on the fire brigade. He said members of the brigade had been interviewed – Mr Elias Cording stated they were dissatisfied with the drill pay and thought it was not enough. Mr Cording suggested 2 guineas per annum, the same as the Tredegar Fire Brigade should be paid and that it should be paid if they drill or not. He also said that they should get 2s. per drill which should be held 12 monthly, with drills in arrears being paid for. The Fire Brigade and Insurance. It was said that the Abertillery Fire Brigade was allegedly insured, with reports of the Brynmawr Fire Brigade bringing their own insurance into force. They – the Nantyglo and Blaina Brigade, should be supplied with jackboots, as they were easier to put on than ordinary boots. Mr Thomas Pritchard said that through lack of drills they had become inefficient and out of form. He also said that their uniforms should be kept at their own homes to keep them dry and clean stating the fire station was damp. Mr Thomas Davies said he agreed with Mr Cording that the firemen should be insured against accidents. The committee recommended the fire brigade should be insured but the other points were not acceded to. Mr Gregson recommended that they should get better men before any alterations, the clerk reassured the men that the other brigades were not insured. Mr Gregson then stated that if any men of the fire brigade were dissatisfied they could resign. The committee’s recommendation was adopted but the applications of the firemen were not taken notice of. After the council had blatantly ignored the firemen’s applications and recommendations on the running of the fire brigade at Blaina many letters of protest were received and published in the South Wales Gazette at the way the fire brigade was being treated. It was made public that the firemen were turning up at drill practice while the officers were absent, yet hadn’t been paid for the back drills. The firemen had also not been paid for one of the past two fires in Blaina, yet were blamed for the inefficiency. Messrs Havard & Morgan Aerated Water Factory Fire. On Friday 3rd August 1900 fire broke out at Messrs Havard and Morgan Aerated Mineral Water factory at Nantyglo, a part of the building burned to the ground and the machinery was badly damaged. In a report from the South Wales Gazette at the time, it was stated that the fire brigade attended the fire at 11.45pm on the Friday night and found their hose was not long enough to reach the hydrant, seven lengths were required and the brigade only had four lengths. Water was carried in buckets and the brigade left at 3.00am Saturday morning. It was recorded that it had been arranged that the J. Lancaster & Co Hooters were to be blown in the valley if a fire had broken out at any premises yet on this occasion the hooters were never blown. After this fire the it was decided to purchase 12 lengths of hose pipe each length being 60′ feet long and the surveyor was ordered to see the relevant authorities in respect to the blowing of hooters at the time of a fire in the district. Towards the end of August 1900 Mr Thomas Davies the lieutenant of the fire brigade resigned. Firemen Mr Griffiths Roberts and Mr D. H. Evans were nominated by the brigade for the vacant position. Mr Griffiths Roberts was appointed as lieutenant. On Monday 29th April 1901 a fire broke out at the Deep Pit, Coalbrookvale, Nantyglo. The fire broke out in the wooden covering of the up-cast shaft at the pit, the Nantyglo and Blaina Fire Brigade were alerted and under the command of Captain Edwin Griffiths, turned out and put the fire under control. On Tuesday 30th April 1901 less than 24 hours after the fire at the Deep Pit, Nantyglo another fire broke out at the Henwain Colliery, Blaina. The fire brigade was again called out under the command of Captain Edwin Griffiths and attended the fire which had broken out on pit bottom, it was reported that a number of horses were in close proximity to the fire and with the assistance of officials from other collieries close-by the horses were saved and the fire got under control. In May 1901 Mr Edwin Griffith had a slight disagreement with the other councillors, he resigned from the board and also handed in his notice as captain of the fire brigade. It was later reported in the South Wales Gazette that the disagreement was over the non-payment of money to one of the firemen under his command. It was stated that the previous week a fire had broken out at Joynson’s Wheelwright Works at Nantyglo and the council objected to a payment made to one of the firemen who was supposedly in attendance when there was insufficient evidence that he was actually present at the fire. The captain was so angered that he left the meeting and later resigned. At the next council meeting the standing orders were suspended in order to rescind the resignation of the captain and Mr Edwin Griffiths was unanimously re-appointed as captain of the fire brigade. In June 1905 the Nantyglo and Blaina Fire Brigade attended the annual demonstration of the South Wales Branch of the National Fire Brigade Union at Aberystwyth. Captain Davies and Lieutenant Roberts attended, accompanied by 16 men. Mr Elias Cording a member of the Blaina Fire Brigade was awarded with a Long Service Medal. In 1905 Mr Thomas McNeill was appointed fireman with the Nantyglo and Blaina Fire Brigade. On Sunday 26th August 1906 a fire broke out in Blaina town, in a premises at 102 High Street in a shop trading as the Direct Supply Company. – P.C. Edwards broke into the premises, Mr Davies was away though the constable found Mrs Davies in bed unaware of the inferno below, she was removed to the Royal Exchange Hotel. P.S. Jones, P.C. Edwards, P.C. Bevan and P.C. Mitchell with the aid of some local residents worked hard to get the fire under control. Though despite all their efforts the shop was completely gutted. It was stated that the fire brigade turned up a quarter of an hour after the fire was under control. They then completely extinguished the flames. On Sunday 16th September 1906 a fire broke out in Blaina town, in a premises at 78a High Street known as a Butchers Shop owned by Mr E. Bush sub-let to the Danish Butter Company. Mr Bush woke to find the shop beneath him was on fire and alerted the fire brigade. The fire brigade were on the scene within 20 minutes though by this time the blaze at the shop was beyond control. After this fire it was reported that the district council were urged to take steps to have direct communication by telephone or otherwise with the residences of members of the fire brigade so they could appear promptly at the scene of a fire. In August 1907 the Nantyglo and Blaina Fire Brigade under the command of Captain W. J. Davies were present at the annual demonstration and competitions of the South Wales District of the National Fire Brigade Union. Fireman Mr George Knight was presented with a Long Service Medal, Fireman Mr James Pritchard with a bar on completing five years service in the brigade. The whole of the brigade acquitted themselves in a very satisfactory manner in the various drills and competitions. In December 1907, Fireman Mr J. Smith was awarded the Long Service Medal, it was reportedly the 4th Long Service Medal to be awarded to members of the Nantyglo and Blaina Fire Brigade. On Wednesday 12th February 1908 a fire broke out in Blaina town, in a premises at High Street called the People’s Cash Market, owned by Mr H. Rudd of Brynmawr. The alarm was given by P.C. Baker who alerted the men in charge of the engines who started the hooters. Sergt James was also on the spot. The Blaina Fire Brigade under the command of Captain W. J. Davies and Lieutenant Roberts were soon at the scene though it was to late to save the building, so the fire brigade was put into action on saving the adjoining properties. The Peoples Cash Market building was completely gutted, as even though there was as reported over 100 people ready to help, it was too hot to get near the premises to get the fire under control. The premises and stock, of mostly furniture was reported as a total loss of between £3,000 and £4,000. The neighbouring properties were all saved from damage. On Tuesday 3rd March 1908 another fire broke out in Blaina town, in a premises at High Street known as a Jewellers and Pawnbrokers, owned by Mr A. Shane of Brynmawr. Captain W. J. Davies was in charge. It was reported that their efforts, this time were hampered by hundreds of members of public who were present, many of whom were on the look out for an opportunity to loot the premises. The fire brigade had no option but to drench the crowd with icy water to disperse them. On Tuesday 4th August 1908 at the Tonypandy Crown Eisteddfod the Blaina Fire Brigade secured third prize in the Fire Brigade competition. On Monday 27th June 1910 a fire broke out in Blaina town, in a premises at 88 High Street known as a Saddlers Shop, owned by Mr J. B. Morgan. 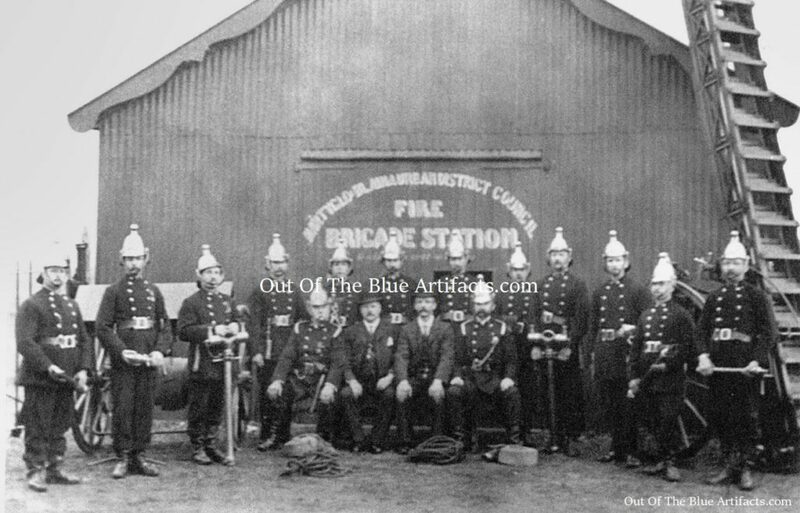 The fire brigade under the command of Captain W. J. Davies and P.C. Jones and P.C. Cotterill commended for their work in getting the fire under control. It was said that there was a point when they thought the whole block of properties would have been lost to the flames. On Friday 26th July 1912 the efficiency of the Blaina Fire Brigade was again under question when it was stated at a Nantyglo and Blaina District Council meeting that the hooters had recently sounded the alarm of a fire at Blaina and because of the wind being in the wrong direction members of the fire brigade had not heard the hooter. Mr J. Pitman said this was a matter of urgency and that the introduction of electric bells should be installed and the system should be adopted straight away. In defence of the brigade the Surveyor Mr W. J. Davies and captain of the fire brigade said they had heard the hooter though decided not to attend as they were told it was just a couple of bales of hay that was on fire. In reply Mr Parry said the fire brigade should have attended and that the electric bell system should be adopted as soon as possible. In 1919 Captain W. J. Davies had resigned from the Nantyglo and Blaina Fire Brigade and Mr Thomas McNeill took command as captain of the brigade. The First Prize Winners 1924. On Saturday 19th July 1924 at a meeting of the South Wales Fire Brigades Association held at Abergavenny, the Nantyglo and Blaina Fire Brigade won first prize in the two-men hose competition, in which 21 teams competed. The Nantyglo and Blaina Fire Brigade was under the command of Captain T. McNeill. The following members were awarded with Bronze Medals for ten years service – Lieutenant A. Elkins. Firemen Mr D. Yates; Mr W. Poulson; Mr A. J. Pritchard and Mr J. H. Jones: Captain Hedley Peters J.P., chairman of the association made the presentations. On Monday 27th June 1927 at a monthly meeting of the Nantyglo and Blaina Council a letter was read from the clerk of the council dated June 16th 1927 requesting that both Abertillery and Blaina Councils install a telephone box at Bournville for the use of the inhabitants of either area for the requisition of the Abertillery or Blaina Fire Brigades. The request was declined. In September 1931 Mr J. T. Davies of 31 Vincent Avenue, Ffosmaen, Nantyglo, was appointed fireman with the Nantyglo and Blaina Fire Brigade. His was one of five applications submitted to the brigade. In May 1937 the South Wales Gazette reported on the death of one of the old members of the Blaina Fire Brigade, Mr Thomas Davies of Gwent Terrace, Blaina. It stated that Mr Davies, 78 years of age, was a native of Brecon and had come to Blaina in 1887. He was a carpenter and undertaker by trade, he had been a keen sportsman, one of the founders of the Blaina Bowls Club, a generous supporter of rugby, cricket and tennis. It stated in the report that Mr Thomas Davies had been awarded a long service medal in connection with the fire brigade. I don’t know the date the fire station moved to its present site, though it was constructed on the grounds of the North Blaina Colliery (Stones Pit). The Closure of the Blaina Fire Station. In about 2013-14 it was decided to close the Blaina Fire Station, the arguments against its closure and the many demonstrations were all in vain and the closure went ahead. Firemen who worked from there as retained fire fighters were transferred to Ebbw Vale and Brynmawr. The Blaina Fire Station closed on the 31st March 2015. Points of Interest – The £78.00 paid for the fire appliances in 1889 is equivalent to £9,300 in today’s money. The appliances purchased at that time were more than probably a hose and reel on wheels, stand pipes and a fire escape, the escapes (as seen to the right on the featured image above) was just a sectional ladder on a set of large diameter wooden wheels. Before the introduction of the fire engines the escapes were wheeled to-and-from the site of any house fire. Later these escapes were attached onto the back of the fire engines. 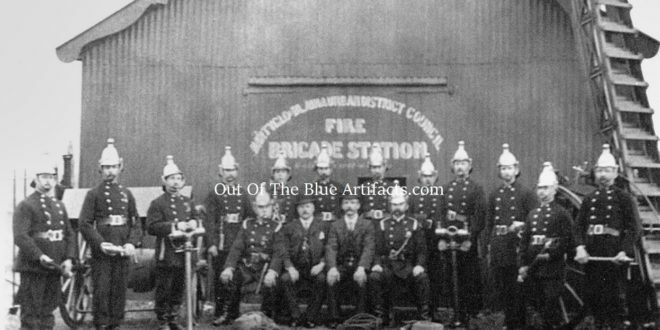 The featured image above of the Nantyglo and Blaina Fire Brigade in full uniform was taken in the 1900’s or slightly later. The writing on the fire station doors states it is the Nantyglo and Blaina Urban District Council Fire Brigade Station. At its formation in 1889-1890 it was under the control of the Nantyglo and Blaina Local Board.